Everyone needs a haircut now and then; perhaps a new pair of shoes, say, or a big woolly jumper to help you play a small part in that current trend for big knits and bold patterns, even if they invariably make you a bit too warm, a bit too fast. But what if you're an emotion-free part-man part-machine creature prone to stomping around the universe like you're in a bad mood? What then? Well, you get to have regular updates of your visual appearance, that's what. And so that's how we come by the picture above - six new-look Cybermen (they now have more 'stuff' on their bodies, compared to how they used to look, see pic, right) - photographed in rehearsals for an episode from Doctor Who's 2013 series. Well, we say 'in rehearsals' but it may have also been 'a take'. And, indeed, going down this route presents us with all sorts of thorny problems that only a therapist should ever hear. 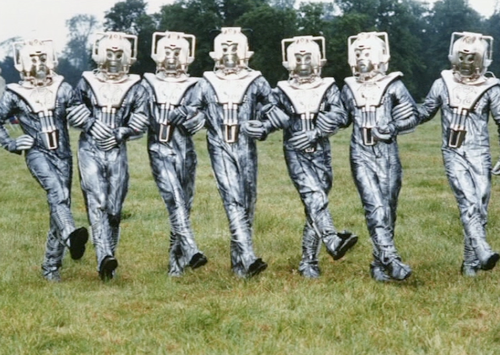 For example, do Cybermen even need to rehearse? Wouldn't they always be word-perfect, and never have a problem remembering their lines? How much does their agent get? What's their rider demands? Who can say? 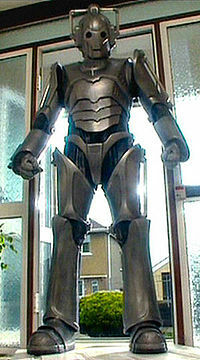 We need to remember that they're men - actors - in a costume, but the thought of there being some deep-space cyber-boutique where the Cybermen get their look upgraded even so often is one that's both briefly amusing and quite possibly plausible enough to be true, assuming, of course, you can accept that a group of dominatory male-only aliens who only prefer their own company and have a penchant for hyper-masculine body-armour and are unable to show any sort of emotion is a possibility. And also, while we're considering the Cybermen's character, sort of, let's ignore the fact that in the top picture they also appear to be menacing somewhere called 'Natty Longshoe's Castle', which, according to the internet, is a faux-medieval castle. Maybe these guys are out on team-building exercise - maybe they have to build a raft, or climb a tree - and will later sit down to a banquet-style lunch, with food served upon large oak tables by buxom wenches, although these guys probably won't really notice the buxom wenches, and are probably more concerned about their sensitivity to dairy, or when their next costume update is coming from. Which is all fair enough, really. No one wants a scruffy alien. 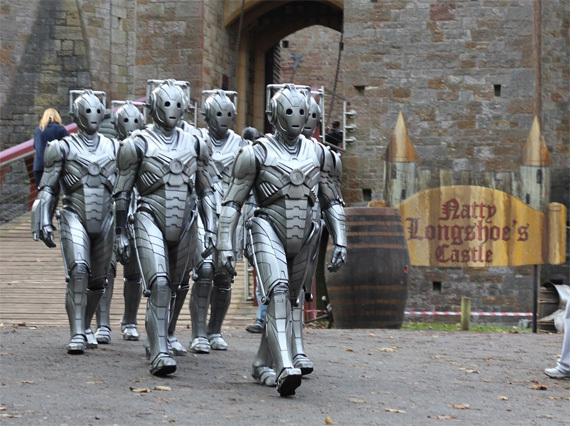 Doctor Who 50th anniversary: Can the fans' high expectations be met?